Spanning over the last two decades many traditions have been formed at the Carrie Haddad Gallery, yet perhaps none as great as that of the Landscape. Shown in many shapes and forms, from the more traditional to the abstract, the evolution and varied perspectives have remained an ever present presence. This year, Carrie Haddad is pleased to present her 21st Landscape Exhibit featuring new works by 4 artists whose works represent this trajectory of Landscapes past, present and future from Traditional to Abstract with Jane Bloodgood-Abrams, Harry Orlyk, Nancy Rutter and Stephen Brophy. Jane Bloodgood-Abrams has been exhibiting with Carrie Haddad for the past 18 years and in many ways we like to say we’ve grown up together. 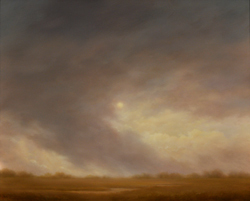 Bloodgood-Abrams’ pieces reference the great tradition of the Hudson River School, yet are made current through her ethereal portrayal of the sublime in each landscape. Inspired by George Inness, she searches for the mystical in nature, bringing to life heaven on earth. By building up layers of transparent glazes, her paintings appear to have light glowing from within. The simple curves of clouds, the bending and swaying of trees, and the breath of Nature, offer a grace that pulls the viewer into the landscape. Bloodgood-Abrams’ work has been chosen for numerous regional, national and international exhibitions, including the New York State Biennial at the NY State Museum in Albany, and exhibits in Austria, Italy, Germany and, of course, NYC. She lives and works right here in the Hudson River Valley. Harry Orlyk paints dramatic yet simple impressionistic views of the surrounding rural landscape. He focuses on contrasting colors produced by natural light, the magnitude of shadows, and the ever changing moods of the seasons. Using a ruggedly textured brushstroke, Orlyk highlights his scenes with an excellent sense of color that even nature must struggle to surpass. Orlyk admits the influence of photographer Lawrence McFarland who taught him what spiritual space is, and how to emphasize it. He credits well-known Nebraska painter Keith Jacobshagen with having impressed on him the importance of routine, hence his discipline of “daily painting”. His attachment to the land and the people who struggle to make their livings working the land is inspired by Van Gogh. Orlyk is a recipient of the highly regarded Guggenheim Fellowship and has exhibited at galleries throughout the country. He currently resides with his family in Salem, New York and has been exhibiting with Carrie Haddad since 2001. Nancy Rutter takes her inspiration from nature, fascinated with the tonal interplay of color and form. Rutter is inspired by Columbia County vistas with ever-changing combinations of atmosphere, light and shadow and uses them as the starting point in her paintings. The abounding tones of each season form her palettes and create structure within her compositions. The final results are large, exuberant and lushly colorful paintings of her “neighborhood”, a rural landscape of gardens, farm roads, ponds and fields. Rutter studied at the High School of Music and Art and the Art Students League in NYC, has taken numerous printmaking workshops and lived and worked in Ireland and France. Stephen Brophy will be exhibiting for the first time with Haddad and represents and interesting cycle in the Gallery’s history. Just before opening her gallery, Haddad attended an exhibit at Colombia Greene Community College and bought two paintings by Brophy which have remained an inspiration to her all these years. With the aid of the internet, Haddad was finally able to track down the artist and is now able to share the work with a larger audience. Brophy paints in a variety of margin: 5pt 0in">A reception for the artists will take place on Saturday, November 3rd from 6-8pm. All are welcome to attend.